Real Ad I Got In My Inbox. 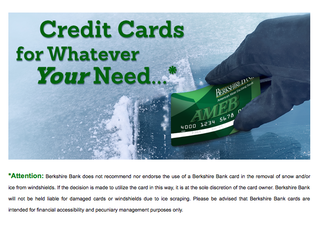 Whether scraping off your windshield or cutting up some Columbian bam bam, Berkshire Bank has you covered! I don’t know how this one slipped through the cracks during the vetting process, but I’m glad it did because it made me laugh out loud when I opened the email. Good job Berkshire Bank, you’ve helped me start my day off with a smile!